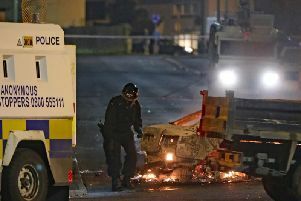 A PSNI spokesman said Velsheda Court has been closed and a number of homes in the area evacuated. Sinn Féin Councillor Ryan Murphy has condemned those responsible for s suspect device which has caused families to be evacuated from their homes in Velsheda Park and Court in Ardoyne. He said: " A suspect device was found this morning in Velsheda Court, Ardoyne. "The discovery of this device has caused serious disruption in the area which has now been sealed off by police with residents from Velsheda Park and Court and neighbouring streets evacuated from their homes. “The local community has rallied round those families who have been evacuated but Belfast City Council has opened its community centre in Herbert Street as an emergency rest centre for residents who may need it. “I condemn those responsible for this incident and they care nothing for the people of Ardoyne..